From a writer of "great talent" comes a "wonderful collection" of stories you "will remember forever" –SPReview. In the 16 stories that comprise Dust of the Universe, V.S. Kemanis tells the tales of families in conflict and harmony, exploring the depth and intractability of interpersonal relationships. A mysterious aunt is buried with a dark family secret. A single mom struggles to care for a severely disabled child. A teenager's friend, the family guest on vacation, disappears into the resort town. 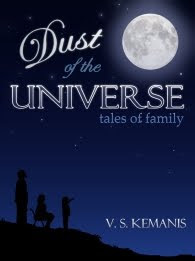 Through these characters and many more, "Dust of the Universe" delivers a reading experience full of the exultant and devastating emotions that only family can bring. The collection includes Glimmer Train Top-25 pick "My Latvian Aunt" and "The Zephyr," originally published in the William & Mary Review.